The fastest animal on the savannah? No, not the cheetah. Or the wildebeest. Or the lion. Let’s start with the runners up, simply as a point of reference. A lion can go about 50 mph. A springbok (small antelope) goes a maximum of 62 mph. Cheetahs hit a top speed of about 64 mph. So what creature leaves them all in the dust? Look up. It’s the peregrine falcon. A bit about peregrine falcons: they’re birds of prey (a predatory bird who hunts and feeds on other animals); they are found on every continent on earth except Antarctica; they can survive in a wide variety of habitats including cities, deserts, tropics and more; they have a wingspan of about 3.5 feet; they dive and catch their prey in mid-air; and they have few natural predators. 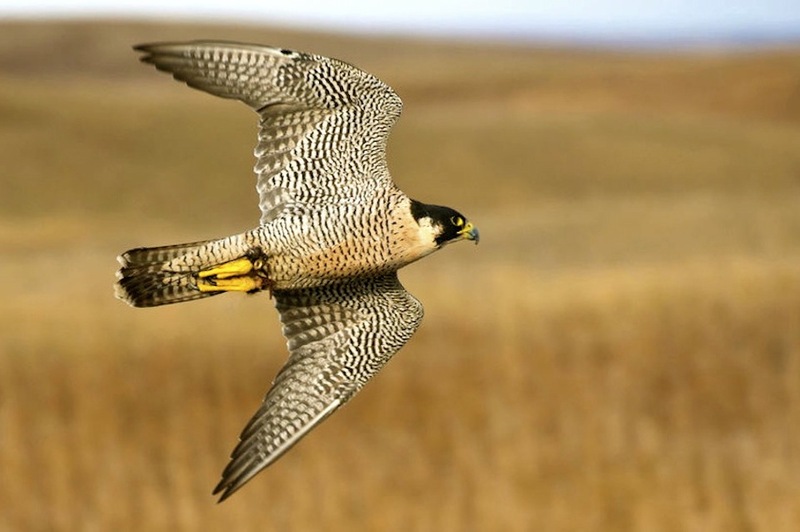 So just how fast are peregrine falcons? They’ve been known to dive at speeds of up to 200 mph. That’s race-car fast. How do they do it? Among other things, light, hollow bones, streamlined feathers, curved wings and powerful flight muscles –– just a few of the very effective tools that help give peregrines speed.